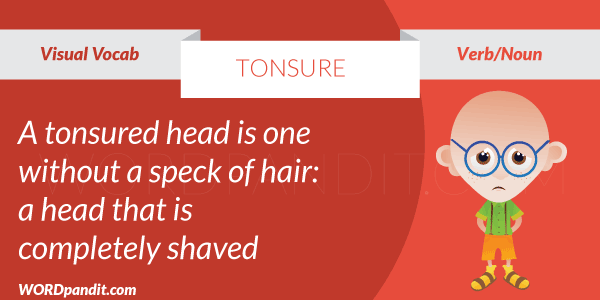 Tonsure is about going bald, willfully. It is shaving one’s head. In India, a baby is tonsured at least once after his birth as it is regarded as auspicious for the child. But one thing for sure, one does not want one’s future to be tonsured, isn’t that so? 1. The act of cutting the hair or shaving the head. 2. The shaving of the head or of some part of it as a religious practice or rite, especially in preparation for entering the priesthood or a monastic order. 3. The part of a cleric’s head, usually the crown, left bare by shaving the hair. 1. The man with the tonsure is speaking of trainee monk Dumitru Ilie who is said to have got “hammered” and spent the night a woman he met at a party. 2. It’s more than a little reminiscent of a tonsure, which is to say the haircut that medieval religious types were known to wear from time to time, making this guy a monkish monkey, a lame pun that only works in English and so almost certainly wasn’t intended.